Next review Empire Today - Empire fixed it!!!!! Thank you for bringing your concerns to our attention. We understand that we have followed up with you and addressed your concerns. For future questions please contact customersupport@empiretoday.com. My carpet was scheduled to be installed on july 13th, 2016. I received confirmation calls the day before and the morning of. An hour before the installers were scheduled to arrive we received a call stating that the carpet was out of stock. My house has been cleared. My wife and I are took the day off of work, $$. The kids are at a sitter, $$. Empires response was one of zero compassion and zero willingness to give us revolution. You can tell that they are so used to dealing with this issue that the customer service reps have no patience and quickly go on the defensive and get quickly irritated. I am still waiting to hear back from them, and now their voice mailboxes are full. Funny, empty in the morning and able to accept messages, full by noon (complaints I am sure). As far as the 50% off sale, it is all tactic. Carpet is a commodity, brands have to stay competitive or they go out of business. 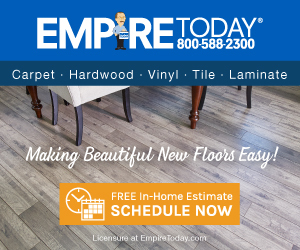 Empire will tell you that their carpet costs twice as much and you are getting the sale. Don't let that fool you. Shop around and you will see that empire is right in line with other businesses. If you do pay a few hundred more for a local company, realize that you will likely get much better customer service and that the smaller companies will likely take ownership of their product and installation. Empire on the other hand has a team in place that is trained to beat around the bush and offer you delay after delay. Good luck getting a rep, sales or management that is willing to go the extra mile for your satisfaction. Reason of review: multiple isssues, price, delays and customer service. Preferred solution: rapid resolution and installation, price reduction, contact and compassion. I didn't like: Many things, Misleading sales, Customer service, Delays, Lack of resolution. Review #881797 is a subjective opinion of boatner1. So far no one has contacted me. I have made effort at contacting empire throughout the day. Lots of messages for management and customer service reps don't seem to have access to any relevant information or have any authority. So it's 5:00 pm, day of install. Install was originally promised to be started at 8 am by sales rep. As it sits, I have received no contact other than my calls. You say you want to make it right for me. What's your plan? I would request an installation time and a reduction in price. My house has been cleared out, I suppose we will leave it like that until we here back. What is my inconvenience worth? I was offered a 200 discount. That is a slap in the face when I went out of my way to be ready for you. It's not on me, it's on you. We sense your frustration and sincerely regret the issues that you experienced. We want to help make things right for you, and will be contacting you soon to address your concerns.